It is not everyday that I find myself walking down the street and the ground is steaming. 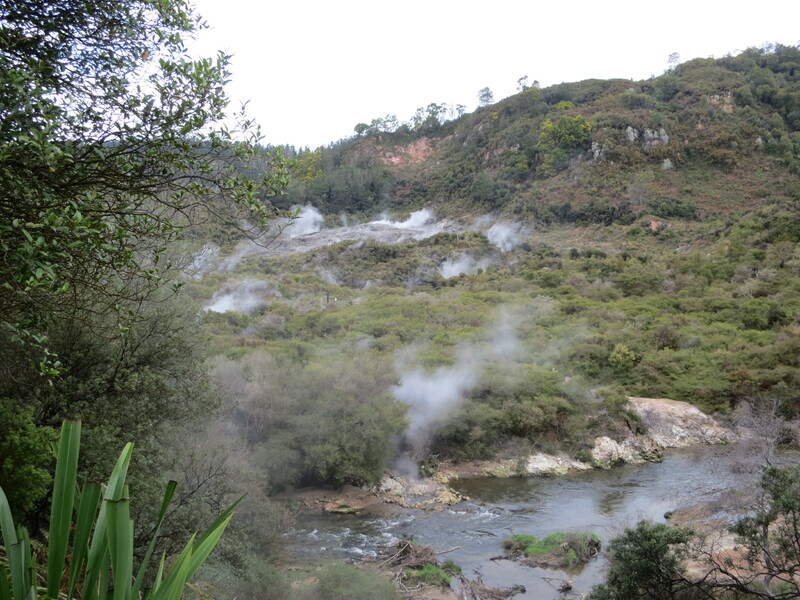 Yes, here in Rotorua, New Zealand, steam shoots out of the ground in almost every direction you look. If I were back home in the States, I would see this and think something is on fire or a factory is at work, but here it is just another one of nature’s wonders. 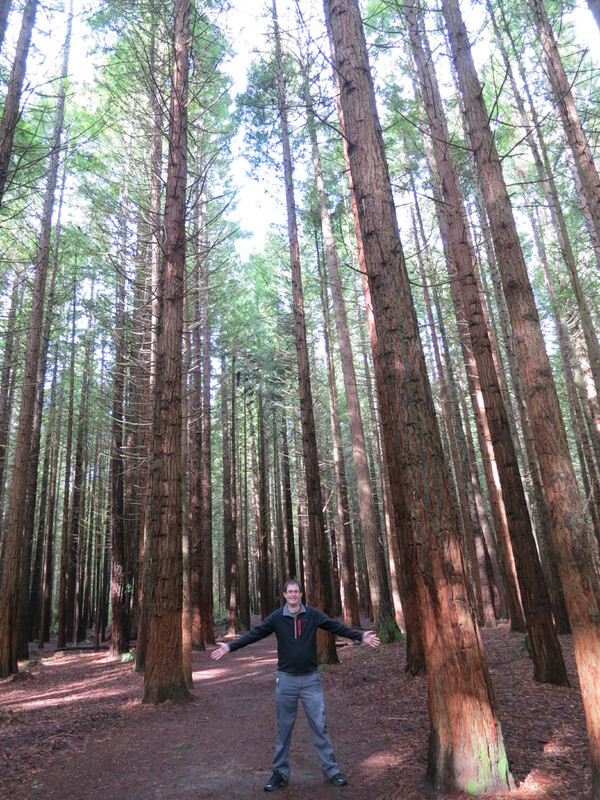 We began our second day in Rotorua doing what we couldn’t do yesterday due the rain: go for a hike through the Redwoods. We visited The Redwoods Whakarewarewa Forest where there are groves of impressive California Redwoods. Apparently they pale in comparison with the ones in the western U.S., but these are quite a bit younger. They were actually planted from the trees native to the United States. After looking at the map, we decided the 34 kilometer hike might be a bit much, but the 2.5k hike was not enough. Like Goldilocks, we settled for the 7.5k walk which was just right. It was well-marked and not too steep, though the climb to some of the look-out points definitely got our heart rate up! The huffing and puffing were totally worth it to see the views from above the city. We could see beautiful Lake Rotorua, but more impressive was the way the earth steamed as though it was about to burst! The geothermal preserve below showcased an abundance of steam rising from the surface, but even farther away from that, off in the distance, steam clouds rise from the middle of the forest. 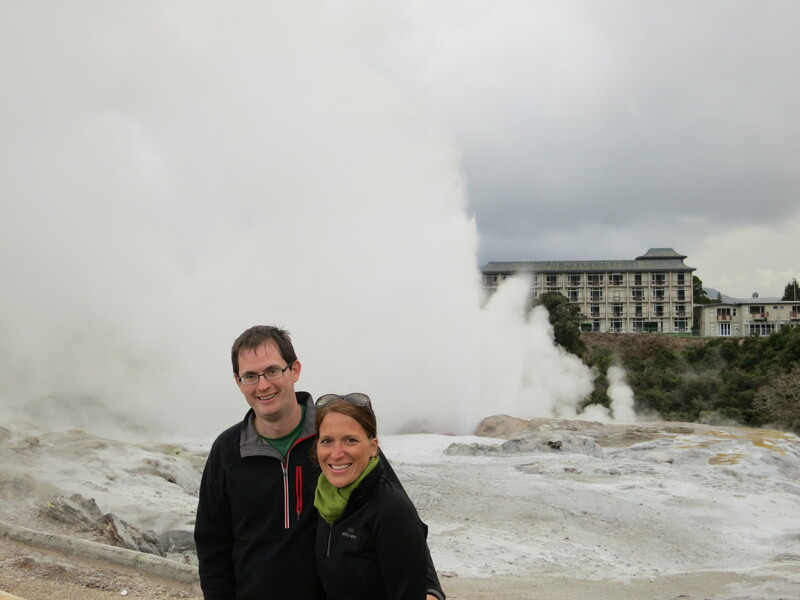 After completing our hike, we went to Te Puia, a Maori village set on the geothermal reserve. Here we witnessed some traditional Maori dances, including a Welcome Ceremony and a War Song. It was interesting and impressive, though it seemed strange to me to clap after a song/dance done by warriors meant to intimidate their enemies. I am always torn in these circumstances between exploitation and appreciation of another culture. I did find it interesting, though I’d love a more authentic experience. Such is the battle of the tourist, I suppose. One of the best things about visiting Te Puia is that we were able to get up close to this amazing geyser, Pohutu (meaning “big splash”) which spews water 90 feet high at a temperature of 90 degrees Celsius! Luckily by the time the mist reached us, it cooled significantly. The sight of this water being under so much pressure that it springs from the earth is amazing. Phil and I keep imagining what it must have been like for the very first person to discover this natural wonder–terrifying, I imagine! Tonight, we are happy to be warm, dry and inside making our first home-cooked meal on the road (well, at least the first one we cooked ourselves). 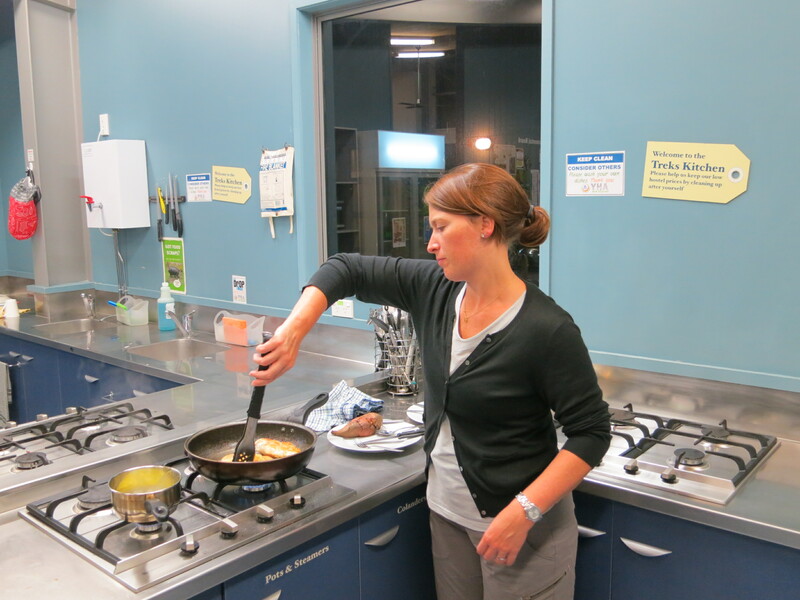 We have found one of the major benefits of staying at hostels is the availability of the kitchen. It is nice not eating out every night, plus a trip to the grocery store in another country is always interesting. Lessons learned: zucchinis are crazy expensive, but brussell sprouts are super cheap. Also, a sweet potato is called a kumira. I love it! For dessert, we try two new candy bars: Kit Kat Chunky and Moro Gold. 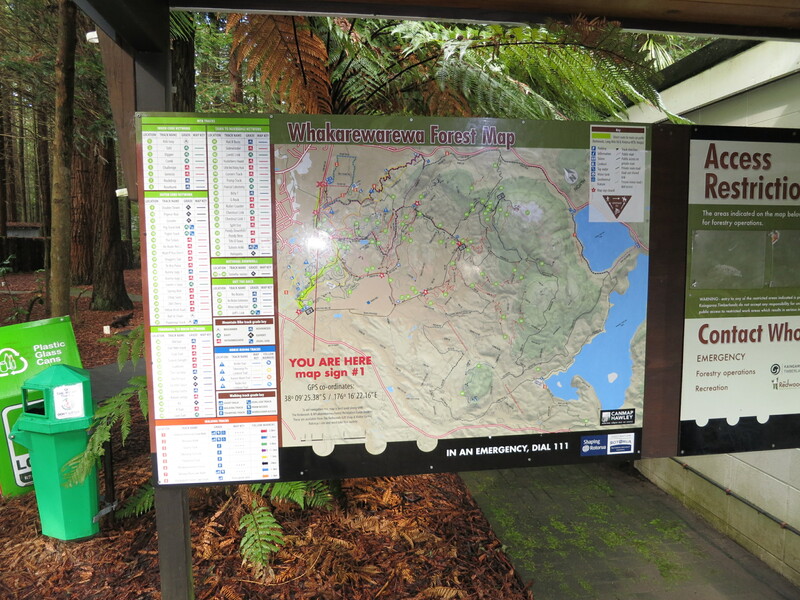 Tomorrow we head out of Rotorua toward Wellington. We will make a brief stop in Napier, which isn’t too far from Mt. Tongariro which is an active volcano that began erupting today. Yikes, as if we weren’t scared enough of volcanoes already! Don’t worry, we promise to stay far away from any hot lava flows!